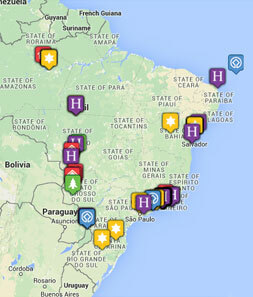 Tribes Overall: "The 3 centre holiday to Brazil was well organised by Paul. The transitions were trouble free. The holiday exceeded our expectations - especially the Pantanal. We felt that having a tailored holiday with personal service was well worth the extra cost." Tribes Service: "Excellent service from Paul. We benefited from having advice from a person who has experience of the area. " Guides: "REGUA/Guapi Assu - our guide Adele was excellent locating birds on the trails. We were also privileged to be guided by the owner, Nicholas Locke. Iguassu Falls - our guide Marcello was well informed and very friendly. Pantanal - our guide Sergio exceeded our expectations. Not only was he very knowledgeable, he also had a good rapport with other guides and the boatmen. He was sensitive to our requirements, and we felt we were very lucky to see so much!" Social & Environmental Responsibility: "REGUA/Guapi Assu - yes, definitely. We were impressed by their philosophy and actions. Iguassu Falls - very commercial! Pantanal - It's a fragile environment with many threats, so we were pleased to hear that they don't intend to improve access along the Transpantaneira highway and encourage further development." Excellent room on the 1st floor overlooking the reserve. Meals and evening drink of caipirinhas most enjoyable. Well laid out trails rich with wildlife. Nice birding on the drive up to the start of the walk to the waterfall. The falls were impressive and the location and seclusion made it a special experience. Typical resort hotel. Food nothing special. However, we enjoyed the garden and trail to the river. Good location for visiting the falls. Accommodation basic on main boat - noisy fisherman can be a problem. There is a new boat moored alongside with more spacious suites. Food excellent. Paul Donahue gave a series of evening talks on jaguars, caimans, giant otters and capybara's, which were informative and very enjoyable Two 4 hr boat trips a day exploring the main and side rivers. Many jaguar and giant otter sightings including a confrontation between the two, as well as a jaguar plunging into the river after a capybara and jaguars mating. Amazing number of birds Sergio and our boatman, Jader could not have made our trip more enjoyable. Good location on Pixaim river. Accommodation basic, food excellent. We enjoyed an extra day here to explore the area on foot, by boat and to take a night drive. Ocelot and giant otter sightings superb. Plus, even more birds, including great potoo and colourful butterflies. "REGUA/Guapi Assu - To see what can be done to reclaim degraded forest and create wetlands to encourage wildlife. Iguassu Falls - Stupendous, especially from the Argentinian side. Southwild Jaguar Floatel - Excellent views of jaguars, giant otters, birds and much more. Seeing the jaguar hunting a capybara and a jaguar teasing the giant otters. SouthWild Pantanal - Excellent views of giant otters (one tried to get into our boat), plus an ocelot from the hide. We also enjoyed the journey along the Transpantaneira with the many rickety bridges, in the open safari vehicle. It wouldn't be the same if it was tarmac "